Amtrak may not make sense in dollars and cents, but I’d hate to see Albany and much of the country lose passenger train service. So I’m glad the U.S. House of Representatives on Wednesday passed HR 749, the Amtrak funding bill. 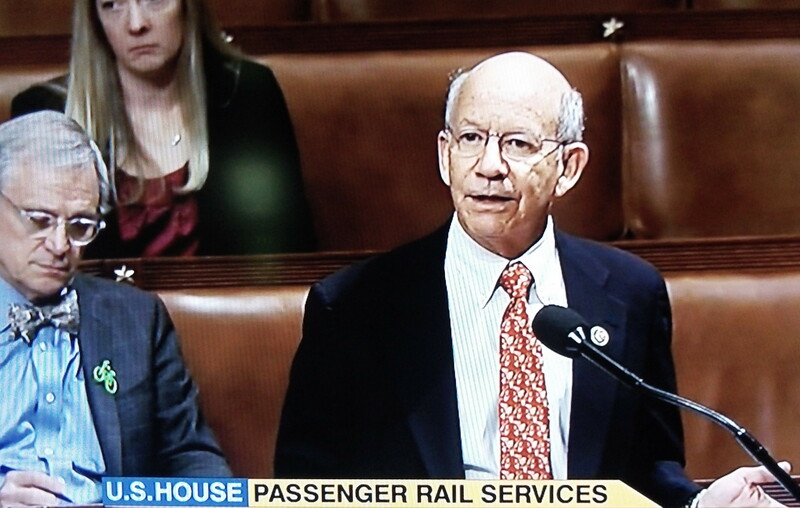 As Oregon’s Congressman Peter DeFazio said on the floor of the House, without passenger trains we’d be like part of the Third World. It’s not as though there are no good reasons to question Amtrak. Rep. Tom McClintock, a Republican from California’s Central Valley, named some of them in arguing for an amendment that would have put an end to federal subsidies of the rail passenger system: Amtrak’s promises of reforming itself and becoming self-sufficient have gone unfulfilled for all the years it has been in business. It keeps losing money. It costs taxpayers $45 every time a passenger steps on a train, up from $32 six years ago. “This is not getting better,” McClintock said. According to him, the average pay of an Amtrak worker selling snacks and drinks is $106,000 a year, which might help explain why the system’s food and beverage operation loses $800 million annually. So why is it a good idea to keep Amtrak alive despite its costs? Because more people are taking the train. DeFazio said ridership is up 14 percent. The system’s losses are getting smaller, down 48 percent, according to DeFazio, the ranking member of the House Transportation Committee. Besides,what good would our nicely restored Albany Station be without the six daily trains that stop there? DeFazio might take the train ONCE! After that, He’d probably resurrect his old Valiant. I disagree. I take the train from Albany to San Francisco every two weeks. It has been on time for all my trips this year. The seats are comfortable. The train leaves at 4:10 p.m. and arrives at 8:45 a.m. I have a current medical condition that prevents me from flying or driving (my eyes); the train is thus my only travel option. I agree that trains are a necessity, as are schools, roads, airlines, and a postal system. It’s clear that I chose the wrong career path. And if that’s an average, I’d love to know the high and low figures 106k is the average of. That’s an obscene figure for that job description. There is another answer: you’re really gullible to accept as fact what a congressman from California’s Central valley says. Mechanical Engineer: $82,835… and so on. Yes, you may have chosen the wrong career path. However, I suspect you were paid what you were worth. That’s what the free enterprise system is built on.